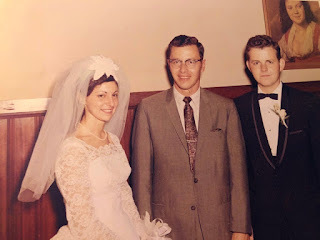 There are a few memories from our wedding day that stand out. One is forgetting the cake knife at home. Now my memory is that my brother who had just gotten his driver's license went home to get it but Bob seems to think he drove back home to get it. Maybe they went together. In addition to making the wedding dress and a brides maid dress and veils and, oh yes, the garter, there were also car decorations to make. 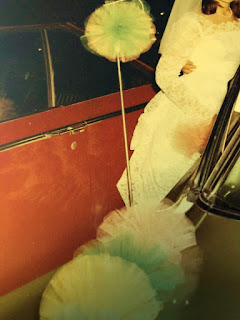 Mom had seen or heard about decorating the wedding car with pom poms made of nylon netting. I'm not sure who all was involved in the making of them. I don't recall making a lot so Mom must have done most of them. Maybe she had a friend help out too. I do know that all of those nylon pom poms were saved and used for years as scrubbers for washing dishes. For some reason the photographer had not gotten a picture of us with Pastor Fish at the church so we arranged to have one taken at the reception. The photographer, as my mother says, had already made several trips to the bar so he might not have been thinking straight by that time. He took us back to the bar area and posed us there against a wall. It wasn't until we looked at the proofs that we realized there was a picture of a bawdy bar maid right behind the Bob's head. I wanted to have it erased from the picture. (Today we would photo shop it.) Bob held his ground. He thought it was funny and insisted it be kept in. My mother would do anything for him. I lost the battle. While not so funny at the time, the best memory that night came after we left the reception. Here we were escaping from my cousin (or so we thought) and we rushed home so that we could change clothes and make our final getaway. The problem was that the house was locked up tighter than a drum and my parents were not in the habit of leaving a hidden key. My parents had a small poodle and she was barking her fool head off as Bob ran around the house trying to figure out how we could get in. We knew if we went back to the reception, my cousin would catch on to our leaving. He found my bedroom window was open. The problem was that it was about six or seven feet above the ground. Somehow Bob managed to hoist himself up, tuxedo and all, into and over the window sill and fight off a poodle who was barking at the intruder until she recognized him and then kept getting in the way as she was so excited to see someone she recognized. Eventually he made it in and went around to open the door for me. We changed quickly and left leaving Suzy, the poodle, wondering what was going on.